Now, took Mom for a manicure and pedicure last week and this is what happened! I think it's just too cool that she went for blue! Talked me into it too - I have polka dots. 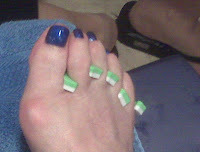 As they were finishing mine up, Mom looks at me and says 'I have nicer feet than you do.' Thanks, Mom. Now, on a different note, here's how John and I spend sunny days. Not a bad life at all. The pool has been quite delightful so far this year and we've actually been in it more this summer. Unfortunately, due to Mom's breathing issues (she can't sometimes! ), she has to stay in the house instead of joining us pool side. I took Mom to a pulmonologist last week as she complains of shortness of breath. Really unfortunately, her breathing spells are unpredictable so movement is sort of restricted at the moment. She's on an inhaler 4 times a day (try to teach a 92 year old to use an inhaler - let's put it this way, senior services would NOT like to see me pinching her nose shut). Anyhow, she's fine today but that doesn't mean she'll be fine in 5 minutes. The pulmonologist did an X-ray which was quite clear - no masses, no nothing. The doctor was fairly impressed! The doctor does want Mom to get a cat scan though so the doctor can get a better idea of why mom has this problem so we'll do that before our follow up visit next month. Other than the breathing thing, she's doing quite well and is chipper, as always.